Sign in the administration panel. Open the Administration tab -> Import data tab -> Products tab. 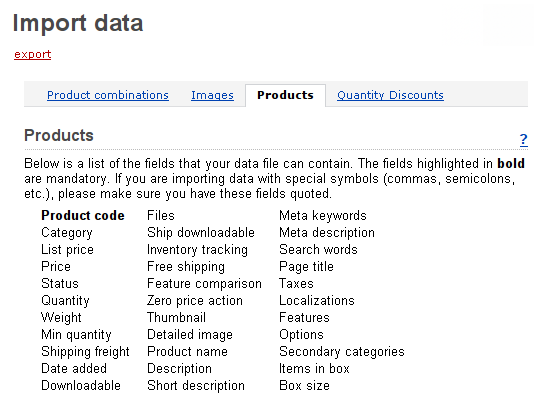 Both the fields in your CSV file and the names in the Product section of this page should have the same names. The values of the fields should have the correct format (means all field values must be in quotes). Have a look at the section Import options below. Language - in the drop down list choose a language in which you want the data to be imported. Category delimiter – choose the delimiter of the category path used in the CSV file, for example: ///Books///Children's books. Images directory - enter the path to the directory where you want images to be located. It is necessary if the image file path isn't specified in the CSV file. Files directory - enter the path to the directory where you want product files to be located (if there are downloadable products). It is necessary if the File field data path isn't specified in the CSV file. CSV delimiter - choose a CSV delimiter you want to use in the CSV file: semicolon, comma, tab. Select file - go to the CSV file with the import data location and choose it. Delete all existing product files before import should be ticked if you need to delete all downloadable products files, existing in your store. Reset inventory should be ticked if you need to reset inventory for the products you're going to import. Click on the button Import.